Fresh off of their win at LAMN Jam, Sad Robot discusses social media strategy, marketing and music branding, and attending industry events. This year, Disc Makers partnered with NARIP (National Association of Record Industry Professionals) to sponsor the Los Angeles Music Network’s LAMN Jam. The competition awarded two top prize packages worth nearly $40,000 each for one pop/rock and one urban/hip-hop artist. Created for record industry professionals, NARIP is the biggest music business network in the world, bringing together leading innovators in the music industry and promoting education and career advancement for record executives. Established in 1988, LAMN promotes career advancement, education, and good will among artists and other creatives, sponsoring industry gatherings, workshops, and seminars with top executives. Their LAMN Jams were developed to give talented artists a platform on which to perform original material for music industry experts. The $40,000 in prizes included a Disc Makers CD package and “everything we offer in a record deal,” said Isaac Heymann, VP of A&R at Epic Records and LAMN Jam talent judge. More importantly, the LAMN Jam gave numerous indie artists an opportunity to dramatically accelerate their careers and their music branding, just as it did for 2011 winners The Mowglis, who signed with Universal/Photo Finish Records shortly after its big win. Making waves ever since their debut, this LA-based quartet has achieved more success on its own than most bands at similar career points. In 2010, the band released its debut EP, The Beginning of the End, and was nominated by the Hollywood Music in Media Awards in its alternative category. 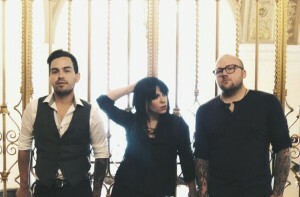 Sad Robot’s debut album, 1.0, was released in the fall of 2012, and the band is currently in the studio working on new tracks for its second full-length release. In addition to the LAMN win, Sad Robot’s music has earned multiple TV placements, has been featured on the SoundHound app, and the band has received press from MTV Buzzworthy and Pure Volume. Following the announcement of its big win, Echoes interviewed the band for opinions on marketing and branding, performing and touring, and the importance of attending industry events. How important is it for bands to participate in industry events? It is always very important to be involved in industry events like mixers, ASCAP seminars, and other contests and networking opportunities like LAMN Jam. Another contest we’ve participated in was an LA King’s Rocco’s music nights contest where thousands of bands submit and they pick their four favorites to perform at the Staples Center for the LA Kings. In addition to the prizes you win, it is such a great experience to be performing at the Staples Center. The relationships you build from that opportunity are great, not to mention that it provides momentum and experience in building your bio. The same goes for the LAMN Jam, which was all about networking and the performance and where you have top industry representatives in various departments critiquing and guiding your performance and songwriting. Plus, you have a network of people right there to help launch your music career. These opportunities are gold and not only help get the word out about you or your band, it also is an amazing learning experience. You can get so much more out of these industry events than just the winnings. What are you biggest takeaways from the experience? So far, it’s been the people and sponsors we will get to work with. With our new album in the works, this really is the perfect time to be working with Disc Makers. The experience has provided us with everything we need to help launch our new album as well as the music video and marketing. We decided to submit to LAMN Jam because we really enjoyed the artists who have won in previous years and saw what a great opportunity it provided for connecting with people who may not have seen us before. And, LAMN Jam has the potential to open new doors for us to help get our music out to new listeners and industry representatives. Are festivals more important or less important than touring independently? Does one provide more opportunities to meet fans than the other? It depends on the band and the fan base they have at that time. We would say festivals can give you a slightly better opportunity when your music is still very new to people. These festivals have a built in fan base and the bands you play with do as well. No matter what time slot you play on most festivals, you will have your music heard by loads of people who have never had the chance to hear it previously. The experience of touring, however, is a priceless one in the fact that there is nothing better than performing your music for the fans who love you and your music most. There is a connection there that is undeniable. Plus, playing in a different city each night really makes you an all around better band. You grow on stage and off stage each night. And, as you travel, you still pick up more fans along the way from the fans you have already. And even if you’re not headlining, when you are the opening band playing before the headlining band with the bigger audience, the chances of you catching some of their fans is great. So, both experiences are a must. You should be doing everything you can to grow your fan base in as many areas possible, making your stage show stronger, and selling merch to afford the travels. Will you be making a return to SXSW next year? How has that experience influenced you? What other festivals have you participated in? We have been a part of SXSW, Sunset Strip Music Festival, KROQ Lobster Fest, and San Diego Music thing so far. Coachella is definitely a dream, and we plan to make another SXSW return. Every SXSW is a great experience for musicians and music lovers. It really is all about the music, not about how many Facebook likes you get and so on. And there are so many talented bands that you get to play with from all over the world that you would never get to play with if it weren’t for SXSW. It is not only a great networking opportunity and showcase, but also incredibly inspiring. As fans, we definitely love attending Coachella, Outside Lands, Lollapalooza, and Bonnaroo. A unique font is just one of the ways you distinguish yourself as a band (and brand) on social media. How did you come up with that, and what other methods have you tried to stand apart from the crowd? With our name, Sad Robot, being so visual, we wanted to have a type of font that would be our own. There is that one standard font you see on every social media outlet and we wanted to have ours be just a little different and hopefully catch your eye while we are sharing our thoughts, experiences, and promoting our shows. The slight change in font was us looking at everything from a point of view that everything we do and create is connected and complements each other. From a social media perspective that includes our font, photos, music, videos, album covers etc. There is a lot of thought and creativity involved in what we do and how we choose to express ourselves, and that has definitely been noticed by our fans — they “like” and “comment” even more than they used to. How much do you utilize social media to gather information from and about your fans? It is very important to engage your fans in whatever way works for you. Asking direct questions is very helpful to get to know your fan base and that can better target your tour, merch, etc. Where this can really help is finding which cities are best to bring your show to as well as if you’re wanting to do something for the fans, such as, “which song would you like us to cover?” In addition, you can try getting your fans involved by asking for artwork for show flyers or even album artwork. This can obviously engage the fans more due to the fact that they now feel like a part of the music in some way. When you want to connect with your fan base and new fans, there is no faster and better way than social media. So post pictures of your life and don’t always just promote your shows, iTunes, merch, etc. Don’t just be a salesman; engage and inspire people. Ask questions, provoke thought, start a dialogue on Twitter, show videos where your fans can see your personality a little better and they feel like they know you even just a bit beyond the music. It gets them more excited and it makes you feel like there isn’t such a huge separation — it can become exciting! The world is now very small due to social media so you can reach out to other countries, and when it’s through your music, there is no better reward.